Though lighting is often taken for granted, its importance to the safety and everyday goings on of nearly everything in our lives is undeniable. This is certainly the case when it comes aviation, where lighting is not only vital for runway operation and the pilot’s vision, but also as a means of communication. In this article I will introduce common light bulbs for the airfield and the aircraft to readers unfamiliar with them, so let’s get started. If you’ve ever flown in an airplane at night, you probably sensed that airfield lighting is vital to the safe operation of aircraft and airport personnel. As you can probably imagine, the numerous elevated lights, inset lights, edge lights, guard lights, and other types of airfield fixtures that illuminate airfields require numerous different types of light bulbs. Airfields need bright light sources that are durable and as low maintenance as possible. Therefore, long lasting halogens and certain HID light sources are commonly used. Halogen bulbs are widely used for their extremely bright white light along with their longer life spans. All types of halogen bulbs are used including MR16s, H-shape aircraft bulbs, PAR38s, PAR56s, and PAR64s. Metal halide and low pressure sodium bulbs are also common in airfield lighting. 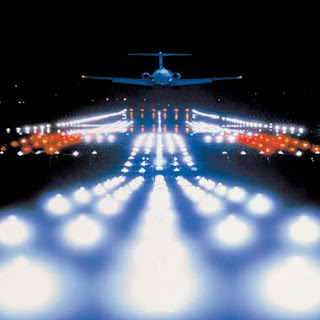 As LEDs improve, airports and airfields are also turning to them for their long lasting light and tremendous durability. Look up at an airplane passing overhead at night and you will likely see at least one pair of lights either blinking or statically lit. Air planes have many light bulbs. On the airplane’s exterior there are usually fixtures on the landing gear/wheel lights, navigation lights on the end of the wings, anti-collision lights on top of the plane, lights above engine, and other lights. The interior of the plane features even more light bulbs shining brightly in both the cockpit and the cabins. In many of these applications, incandescent bulbs and halogen light bulbs have typically been the standard. With the rise of LEDs however, many of the aircraft’s external and internal incandescent and HID lighting have been replaced with them because they are extremely durable and long lasting. LEDs are particularly useful in cockpit lighting because they take up little space, do not require ballasts, and produce little to no heat. For applications like landing gear however, there is no beating halogen or metal halide lamps. Metal halide and halogen lamps produce the bright white light necessary for the safe operation of the aircraft in the air and on the ground. The excellent performance and light quality of metal halide lamps also makes them a popular choice. Hopefully this article has been moderately informative and you have learned something about the wide, wild world of aviation lighting. If you have anymore questions please leave a comment or question on our blog or Facebook or give us a call at 1-877-622-0897.